"Mission: Impossible - Fallout" starring Tom Cruise opens this weekend. Paramount's mission at the box office this weekend is to sell a franchise in which the main attraction is not a blockbuster brand, but a movie star. 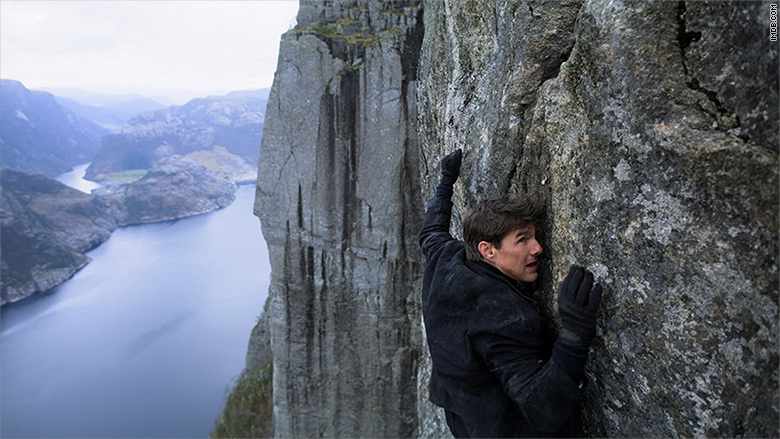 "Mission: Impossible - Fallout," the sixth film in the series starring Tom Cruise made $23 million for its opening day Friday and is expected to open at roughly $50 million domestically this weekend, according to analysts. That would make it the third biggest opening for the "Mission: Impossible" series and one of the biggest for Paramount this year. "Tom Cruise is Paramount's golden goose, because there aren't a lot of pure action stars in Hollywood anymore, and especially ones that have the international name recognition he has, especially with a franchise," Brian Truitt, USA Today's film critic, told CNN. Blockbusters are less about star power these days and more about the power of intellectual property. When moviegoers head to the theaters for "Avengers: Infinity War," they are going because it's a Marvel movie. When audiences go to watch "Fallout" this weekend, they are going because it's a Tom Cruise movie. Blockbuster brand movie stars are rare in Hollywood at the moment. Arnold Schwarzenegger was the Terminator in four movies. Johnny Depp was Captain Jack Sparrow for five "Pirates of the Caribbean" films. But due to box office fatigue, this model has been replaced by brand-driven franchises like Marvel and "Star Wars." Cruise bucks the franchise trend as the face of the "Mission: Impossible" movies, which has made nearly $3 billion since 1996. When moviegoers see Chris Evans or Chris Hemsworth in an "Avengers" film, they see Captain American and Thor, according to Truitt. "When I watch a 'Mission: Impossible' film, I see Tom Cruise," he said. "I forget half the time that his character's name is Ethan Hunt because he owns that role and these movies so much." Paramount is ranked sixth at the box office this year among major studios, bringing in just $346 million domestically, according to comScore (SCOR). Disney, at first place, has made $2.5 billion so far this year. After "Fallout," Paramount's best chance at a global blockbuster is its December release of the "Transformers" spin-off, "Bumblebee." The studio needs to really sell "Fallout" this weekend and that means going all out for Cruise. This is apparent in the marketing for "Fallout." Cruise is prominently featured in the trailer and his name is the only one that appears in some of the posters, even though the film boasts an all-star cast that includes Oscar-nominated actress Angela Bassett, Henry Cavill and Ving Rhames. "There's no way this franchise would have the same appeal without Tom," Nikki Novak, a correspondent for Fandango, told CNN. More than 80% of the people planning to see this movie are heading to the theater because they "look forward to Tom Cruise topping himself with his own stunts," according to a Fandango survey of 1,000 moviegoers. Those real, death-defying stunts are a signature selling point of Cruise and "Mission: Impossible." The franchise has also helped the 56-year-old star, who also serves as a producer, remain a major player in Hollywood for the latter half of his career. Although Cruise has never had a $100 million opening weekend, he has been a consistent box office star. His films have made $9.1 billion worldwide over the course of his nearly 40-year career. Four of his top five highest-grossing hits were "Mission: Impossible" films. The franchise also helped Cruise's rehabilitate his reputation after his infamous interview with Oprah Winfrey in 2005, during which Cruise acted erratically and jumped on her couch -- an incident that drew public scrutiny about his mental stability. "Mission: Impossible - Ghost Protocol," the fourth in the series, "essentially brought Cruise back from 'couch jumping' infamy," wrote Forbes' Scott Mendelson.